Cousins finished the game against the Saints 20-of-25 for 324 passing yards and four touchdowns. How did I come to that seemingly outrageous conclusion beforehand? I'll show you. In addition to revealing the science behind my nine-month-old tweets that make for great humble brags, I'll explain the makeup of a valuable DFS quarterback, how to identify the top values in a given week, and how to tailor your approach at the position to the type of contest you're playing in. One way to gain an edge over some of your competition is to avoid falling victim to information overload and its negative consequences on decision making. There are a plethora of stats out there, but only a select few will truly help you make optimal fantasy decisions -- the rest is noise. Unlike the other positions, a quarterback's fantasy productivity is driven more so by efficiency than by attempt volume. To understand why this is the case, consider that on a per-play basis over the last three seasons, the average pass attempt has produced less FanDuel points (0.44) than the average receiving target (1.30) or rushing attempt (0.55). It’s simple: of all the fantasy positions, quarterbacks have the least to gain from each additional opportunity. The implication here is that you shouldn’t target a quarterback because he's expected to play from behind and therefore see an uptick in attempts. More attempts don't necessarily equal more value. While offenses do generally throw more when trailing, the fact that they're trailing in the first place more often than not indicates a lack of efficiency -- especially in the all-important touchdown category. With the understanding that a quarterback needs to be efficient to be productive in fantasy, the question then becomes, in what situations are quarterbacks most efficient? Quarterbacks tend to put up better numbers at home than they do on the road and also tend to fare better in games where their team is the Vegas favorite to win. Combine those, and it's no surprise that quarterbacks produce far and away the greatest ROI as home favorites. If you want an example of Vegas lines in action, look no further than Matthew Stafford's 2015 season. In five games as a favorite, Stafford averaged 314 passing yards, 2.6 touchdowns, and 0.4 interceptions; in 11 games as an underdog, he averaged only 245 passing yards, 1.7 touchdowns, and 1.0 interceptions. 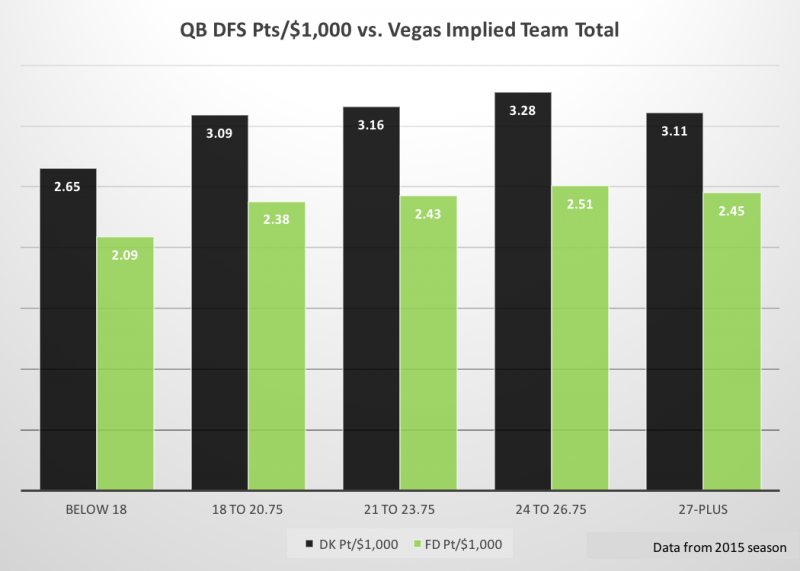 There was a positive relationship between Vegas implied total and quarterback DFS value up until a peak at 27 implied points. There was no decline in actual performance at that level, so the dip most likely has something to do with individual site pricing -- it's possible sites are deliberately overpricing the most obvious plays, which tend to be on teams with high Vegas totals. On FanDuel, the dip was almost inconsequential, but it looks as though DraftKings overpriced quarterbacks with high team totals (or perhaps underpriced quarterbacks with moderate team totals). In any case, the main takeaway here is that a team total of at least 24 is ideal. Another thing to look out for is when a team's Vegas implied total significantly exceeds its actual points per game average. Again using Stafford as an example, his Lions averaged only 18.5 points coming in to a Week 12 Thanksgiving Day game against the Eagles, but the Lions' implied total of 24 was 5.5 points higher than their season average. (Another positive sign for Stafford was that he had accounted for 89 percent of their offensive touchdowns -- much higher than the league average.) The Lions ended up dropping 45 points that day, and Stafford finished with 405 yards and 4 touchdowns passing, as well as 37 yards rushing -- all for a mere cost of $7,200 on FanDuel and $5,800 on DraftKings. Going back to the example in the introduction, the same was true of Cousins, whose Redskins had a team total around 25 even though they averaged under 20 points on the season. The great thing about relying on Vegas team totals when you select a quarterback is that all the nuances of a particular matchup are reflected in a single number. That includes factors that are certainly worth analyzing but that would otherwise be difficult to quantify, such as pass blocking matchups, injuries, etc. The ideal scenario is when a quarterback's team has a high Vegas total and his opponent has a low ranking in schedule-adjusted fantasy points allowed (aFPA). Adjusting for strength of schedule is a must -- the initials TB might be the only thing Tom Brady and Teddy Bridgewater will ever have in common, yet raw, unadjusted fantasy points allowed would treat them as the same caliber of passer. Cash games can be won with a lineup that merely scores above average relative to the field, so maximizing your floor by minimizing busts should be a priority, especially on the players you spend high amounts of salary on. With quarterbacks, minimizing your bust rate is usually as simple as targeting home favorites with team totals of 24 or higher as much as possible. But an understanding of what makes a quarterback valuable is only part of the puzzle -- you also have to know how to translate that information into an optimal decision-making process for constructing lineups based on game type. Quarterbacks post the most consistent week-to-week fantasy point totals of any position, and when I first started playing DFS, the expert consensus was to prioritize paying up for that consistency in cash games. I agreed in theory -- if you had to make a choice between equally projected lineups where the only difference was one had a cheap quarterback and the other had an expensive one, you would indeed maximize your floor by paying up for the most consistent position. In practice, however, those situations have become exceedingly rare, and I often found myself gravitating to cheaper options at quarterback in cash games -- even extolling the viability of minimum priced quarterbacks in last year's version of this article. It turns out that it did indeed make sense to favor cheaper options at quarterback in cash games. Why? Because quarterbacks are priced differently than the other positions -- to the point where they score way more points per dollar than any other position (on FanDuel and DraftKings, at least). Below is a table of the average points per $1,000 scored by each position in 2015. The sample includes all viable DFS options from last season, which I defined as every starting quarterback, kicker, and D/ST, as well as running backs and wide receivers projected for at least 8.0 half-PPR points and tight ends projected for at least 6.0 half-PPR points. Over the past three seasons, passing attempts, yardage, and touchdowns have all been at the highest point in the history of the league. The offensive explosion of 2011 was once considered a lockout-induced outlier, but is now the norm. These record passing numbers have resulted in a bunch of undervalued quarterbacks at the middle and lower salary tiers. While it’s true that high-priced quarterbacks had a higher floor and produced more points per dollar than similarly priced players at other positions in 2015, quarterbacks in the middle and lower pricing tiers had even higher floors and produced even more value. That means you can feel confident slotting a cheap option into your QB slot and using your cap space to maximize your floor at the other positions where there will be a more limited supply of high-floor plays each week. I like to start my lineup building process by starting from the bottom of the quarterback salaries and working my way up until I find the cheapest playable option. I keep that in my back pocket and only upgrade if I'm not sacrificing consistency elsewhere. Rostering a high-priced quarterback is a luxury, not a priority, in cash games. Essentially, the Late Round Quarterback strategy works in DFS, too. Winners trended towards contrarian selections at QB on both sites. There are usually plenty of viable options to fill the lone QB slot in a given week, but the field as a whole tends to disproportionately gravitate towards the top few options, leaving the lesser-owned options ripe with opportunity. Winners on DraftKings allocated much less salary at QB than WR2, but winners on FanDuel allocated more salary at QB than WR2. 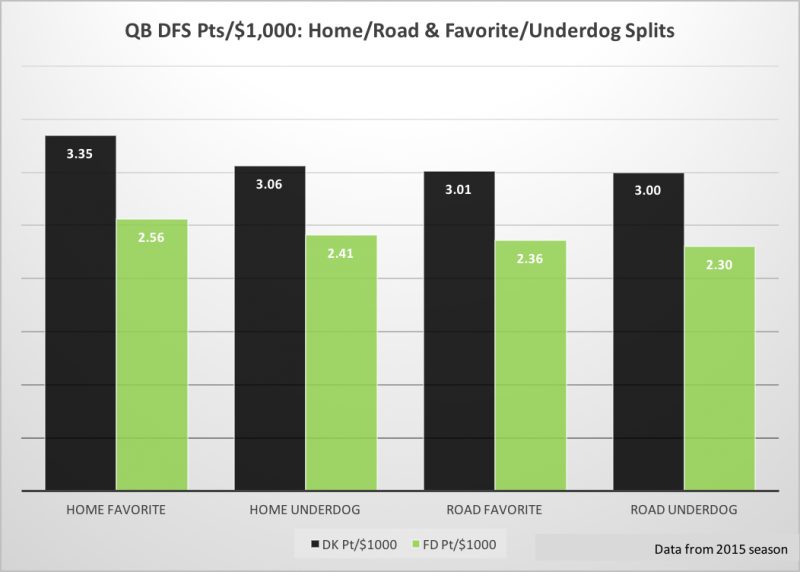 This is due to the differences between each site -- DraftKings depresses quarterback pricing more so than FanDuel, and DraftKings' full-PPR scoring system enhances wide receiver value relative to other positions. Due to the especially depressed QB pricing on DraftKings, it's a little easier to take down a tournament without hitting on the highest scoring play of the day as long as you hit on a great point per dollar value, whereas on FanDuel you're more likely to need to hit on the highest scorer of the day, regardless of cost. We'll close out with an always popular GPP topic: stacking. QB-WR1 is the most effective stacking strategy. Stacking a QBs with members of opposing team’s passing game has merit -- the shootout effect. No need to avoid a QB-RB stack. The relationship between the two positions have is positive, and by stacking a QB-RB1, it can enable you to account for all of a team's touchdowns when the team puts a lot of points on the board. Quarterbacks put up better numbers as home favorites and as their Vegas implied team total increases. Quarterbacks are the most consistent position with the highest floor, which leads to a bunch of usable cash game value in the middle and lower salary tiers. The most strongly correlated stack is QB-WR1. The team's RB1 and other receivers are also positively correlated, as are members of the opposing team's passing game. You'll usually need a low-owned quarterback to take down a large tournament. 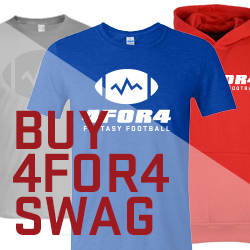 4for4's DFS Subscription has site-specific lineup generators (now with floor/ceiling projections), stack value reports, tons of in-depth content and more. You can subscribe here.